General Note: Road network changes subject to concept planning. General Note: Alternative access to surrounding area subject to concept planning. Yellowhead Trail is becoming a freeway. This means three lanes of free-flowing traffic in each direction. The target speed will be 80km/hr. To do this, current signalized intersections and access on or off Yellowhead Trail will need to be removed and two new interchanges will be built. 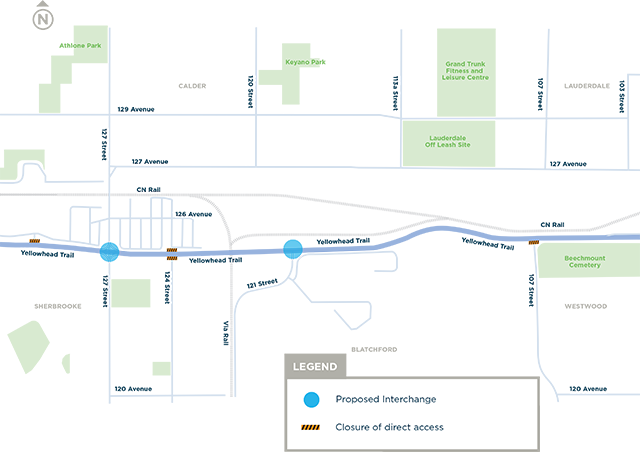 Road users will exit and enter Yellowhead Trail at the nearest interchange or a new parallel service road. For some areas of the Yellowhead Trail, we are further along in the design process as concept planning is finished. In other areas, like 127 Street and 121 Street, concept planning will start in 2019. 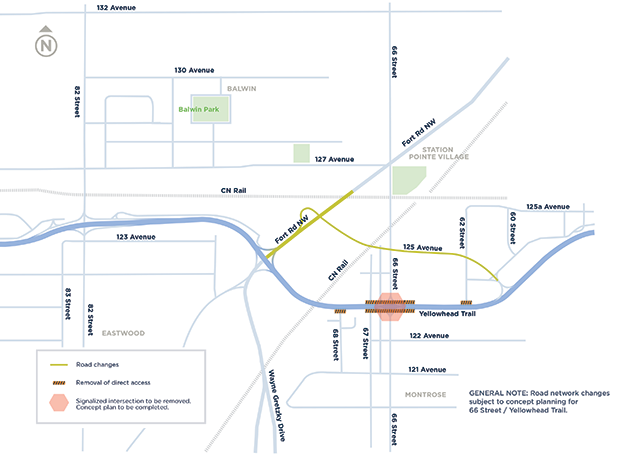 In 2011-2012, the City of Edmonton completed and endorsed a strategic plan for the development of Yellowhead Trail to become a freeway. This expansion is part of Edmonton’s Transportation Master Plan and will help to move goods and services more efficiently through this part of the City. The proposed plan will improve traffic flow along Yellowhead Trail as traffic volumes continue to grow and will significantly improve safety at several high-collision locations. Yellowhead Trail has mature and fully developed areas on both the north and south sides of the roadway which have been a key consideration in developing the proposed strategy. Depending upon the scale of improvement within the corridor, some property acquisition will be required. On December 16, 2016, the Government of Canada and the Government of Alberta joined the City of Edmonton to announce joint funding for improving the Yellowhead Trail to better accommodate current and future traffic. The federal and provincial governments are each contributing up to $241.6 million, with the City of Edmonton providing remaining funding for a total of over $1 billion. The overall freeway conversion will be complete by the end of 2026. Construction will begin in some roadways and areas connecting to the Yellowhead Trail corridor in 2019 but some of the larger more significant projects on Yellowhead Trail itself will not begin until 2020. Below is the estimated overall program schedule for construction. Various construction projects are included in the overall conversion of Yellowhead Trail to a freeway and construction timing has been coordinated considering efficiency and to minimize impacts to the public. The Yellowhead Trail Freeway Conversion will require changes to key areas along the route, such as the intersection at 149 Street. Planning, design and construction will upgrade the section from St. Albert Trail to 97 Street as part of the Yellowhead Trail Freeway Conversion. 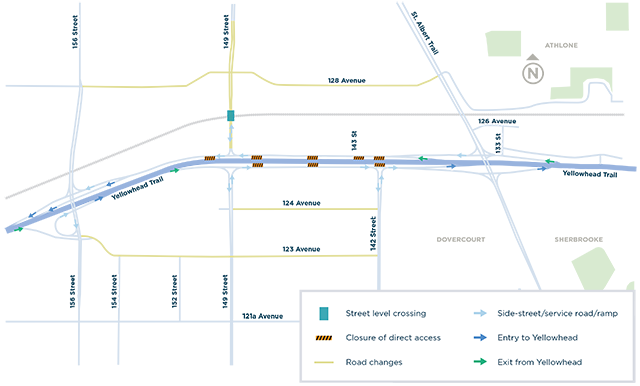 The Yellowhead Trail Freeway Conversion will require changes to key areas along the route, including the intersection at 89 Street. The Yellowhead Trail Freeway Conversion includes the widening of Fort Road to six lanes from Yellowhead Trail to 66 Street. 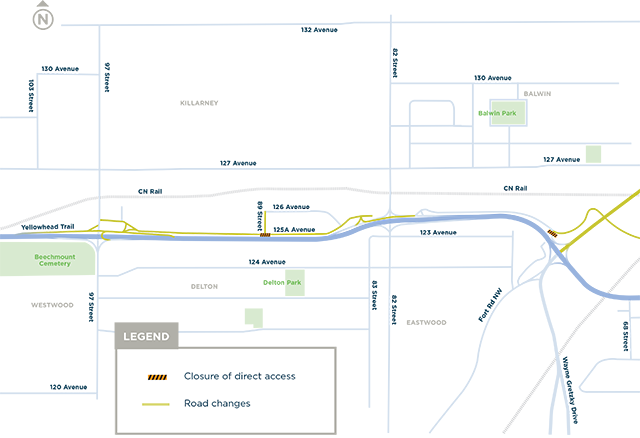 The Yellowhead Trail Freeway Conversion will require changes to key areas along the route, such as the area around 66 Street and at Fort Road. As part of the Yellowhead Trail Freeway Conversion, changes will include widening the road to 6 lanes from 50 Street, east towards the river. Your input is important to us. Join the conversation. 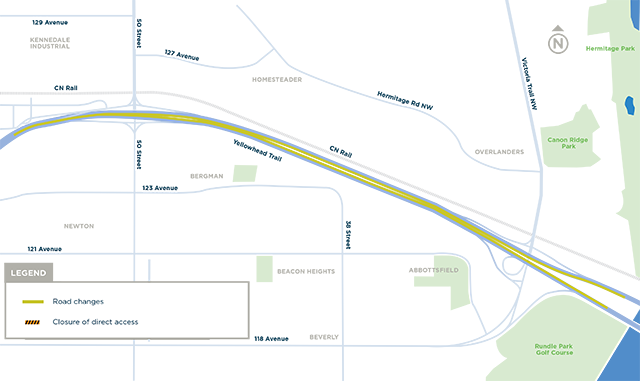 Expansion of the LRT network includes the northwest leg of the Metro Line which will cross Yellowhead Trail.